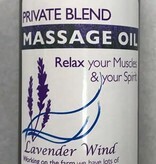 Massage Oil with a blend of oils and a smooth scent. Relax your muscles and your spirit! Rub this gently fragrant oil on skin for a massage that feels warm and soothing. Made with natural oils formulated for healthy skin care.